International Grenache Day: how many days do these grapes need? As it happens, this Friday is International Grenache Day. This might come as a surprise, particularly since it’s only three weeks since Cabernet Day. How many days to these grapes need? If I approached my favourite wine retailer wearing a loud shirt and demanding a special grenache-centred activity, I could probably expect to leave with a seriously tarnished reputation and a bottle of Chateauneuf-du-Pape, probably the most famous wine in which it usually takes the starring role. But does grenache even need all this attention? It is, after all, the world’s fourth most-planted varietal. In France it is No2 behind only merlot while in Spain it is top of the red grape charts and spread across 120,000 hectares – an area, fact fans, almost exactly the size of Bedfordshire. Plus there’s a fair amount of its pale-skinned cousin, grenache blanc, and a scant smattering of grenache gris. There are plenty of genuinely obscure grape varieties which could use a bit of publicity – International Reichensteiner Day might help everyone learn a thing or two – but grenache? Well, because it is most frequently used in blends, and much of the time isn’t even mentioned on labels, many in the business consider grenache deprived of attention. Plus 40,000 hectares worldwide have been dug up over the last decade, making it officially threatened. But most importantly it’s worth celebrating, no matter the date, because it frequently goes to make brilliant wines in a dazzling range of styles. For most of the year in the CellarFella household grenache day falls about twice a week. One or other member of the grenache family sits at the heart of many of the most enjoyable pinks, reds and stickies from Spain, France and elsewhere. Recently I’ve been loving Oddbins’ Domaine Mas Theo Coteaux du Tricastin 2007, a peppery, vibrant organic equal blend of grenache and syrah from the Rhone valley, and developing a taste for the fortified reds of Banyuls such as this one from the Wine Society – one for completists containing as it does the full house of grenaches noir, blanc and gris. I’m not convinced about the merits of International Grenache Day, but all the same I’m ready to proclaim my love of this incredibly versatile family of grapes (though the loud shirt might be a step too far). 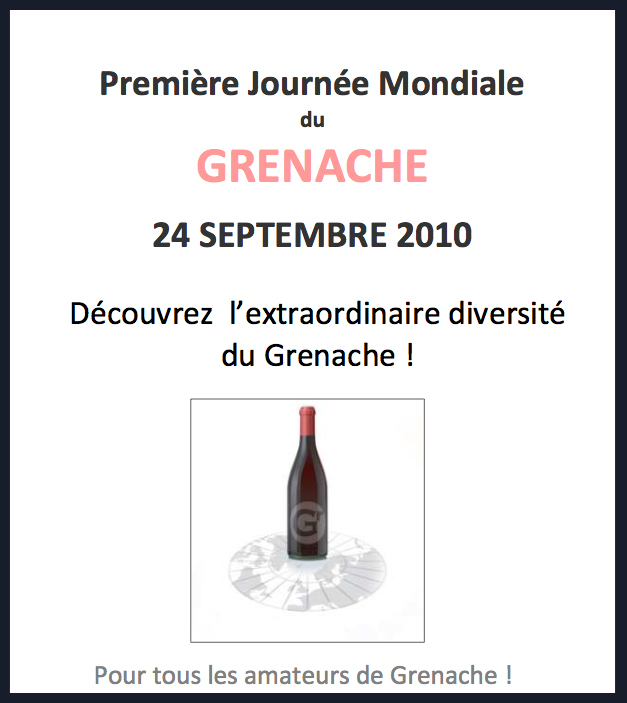 This entry was posted in Uncategorized and tagged grenache, International Grenache Day. Bookmark the permalink. Good read and very informative. I really love Grenache both in Rhone and Spain… but you’re right; why are we celebrating one varietal at a time??? I celebrate a varietal daily!